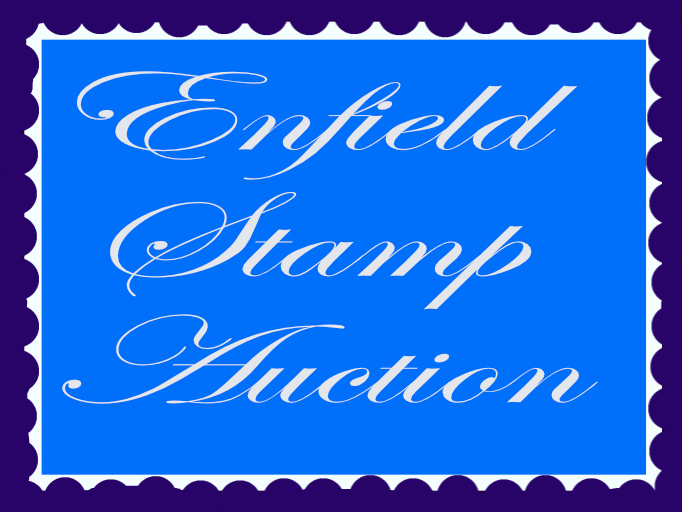 Enfield Stamp Auction 1004 ending 06.04.19 - Enfield Stamp Company Ltd.
20 1926-30 3d. dull ultra.,Die I,Perf.13 1/2 x 12 1/2,M.,HR.,good. 23 1937-49 10s. dull purple,Ovpt’d “Specimen”,UM.,well centred,fine. six(3 x 2)showing Perf.misalignment from comb adjustment,fine. 46 1899-1905 1/2d. yell.-green,Perf.12 x 11 1/2 comb,M.,HR.,fine. 55 1901-10 5d. purple-brown,Perf.12 x 12 1/2,Wmk.inv.,U.,very fine. 66 1911-19 3s. black & green,UM.,bottom marg.,centred to top,fine. 82 1956-51 1/2a.on 1/2d.to 1r.on 1/6 Surch.set,M.,HR.,good to fine. 83 1957-59 1NP.on 5d.to 75NP.on 1/3 Surch.set,M.,HR.,good to fine. 124 1952-54 1/2a.on 1/2d.to 1r.on 1/6 Ovpt.set,M.,HR.,good to fine. 154 Revenues:1885 12s. brown,The Stamp Act,Wmk.Anchor,UM.,one Perf. large marg.,just trimmed along frameline at top,most presentable. 169 1857-64 1/2d. dull mauve,white paper,M.,full og.,four marg.,fine. 180 1863-66 1/2d.reddish-lilac,Perf.12 1/2.M.,part og.,rough Perfs. 184 1866-68 1d.,3d.,carmine-rose,bright rose,Perf.14,M.,good to fine. 200 1882 16c.on 24c.to 20c.on 64c.M.(16c. )& UM.(20c. )blocks of 4,16c. twenty-two with Gutter dividing two part pane of 16,minor vert. 209 1885 10c.on 36c.blue,M.,HR.,good. Not certified. Sold `As Is’. 214 1885 25c.on 32c.slate,UM.bottom marg.bl.of nine(3×3),very fine. 219 1885 30c.on 36c.blue,var.Ovpt.inverted,U.,heavy `A’ cancel & cds. fine. With RPS.Cert. (1962).Almost certainly is a Sperati forgery. 252 1938-49 5r.green & purple,chalky paper,UM.,usual toned gum,fine. A & resembles Die II,Wmk.MCA.sideways(crown to left of CA.),UM. 263 1912-15 6c. carmine,Wmk.MCA.invetred & reversed,UM.right marg.bl. 271 1912-25 50c. black & scarlet,Wmk.MCA.inv.,UM.vert.pair,very fine. 276 1912-15 5r. black on blue-green,Ovpt’d Specimen in red,M.,fine. 285 1921-32 15c. green on pale yell.,Die I,Wmk.script,UM.top left Pl. 308 1935 6c. S.J.var. diagonal line by Turret,M.,HR.,good to fine. 315 1938-49 50c.black & mauve,Perf.14 line,UM.bottom Imprint marg.bl. 349 Officials:1869 8d. choc.,Ovpt’d SERVICE,unissued,M.,top Perfs. 350 Officials:1869 2s. deep blue,Ovpt’d SERVICE,unissued,Unused,good. 386 1853-61 20c. dark royal blue,Imperf.,Unused(traces of gum)horiz. pair,four marg.,close at bottom-right,righthand stamp faint vert. 406 1859-70 80c. bright rose,U.,light dotted Pmk.,four marg.,fine. 423 1903 1f. olive on toned paper,P.& C.,M.,large hinge remains,good. 425 P.Dues:1884 50c. black on green,M.,large even marg.,very fine. 434 1914 10 on 5Pf.Type I & Type II,UM.,tiny Perf.have spots & vert. binding edge at left,trimmed Perfs.two sides,good. (1) SG.84,Mi. Numeral Pmk.,four marg.,large at left & bottom,fine. R.P.S.Cert. 493 Red-brown,N-K,var.K.filled with colour,appears UM.,four marg. 508 Orange-brown,K-J,U.,part blur Numeral Pmk.at left,four marg. bottom-left,fine. N.B:Originally a strip of eight. (8) SG.17var. 515 2d. pale blue,Pl.4,Q-L,U.,Numeral Pmk.,centred to top-left,good. 517 1d. red-brown,Die I,Wmk.S.C.,Perf.14,U.,light Scots Numeral,good. 518 1d.orange-brown,Perf.14,small crown,D.II,Pl.7,HE,var.dot in marg. 542 3d. rose,Pl.10,U.,Scots Numeral Pmk.,good to fine. Scarce Plate. 558 5d. dull purple & ultra.,ord.paper,M.,faint marks on gum,good. 579 10d. dull reddish-purple & carmine,UM.,minute black spot on gum. 581 1911 1d. carmine,Die IB,Wmk.Crown,M.,lower-right A11(wide)horiz. 586 1912 1/2d. deep green,Wmk.Mult.Cypher,UM. (2),M.block four,fine. 597 1912-24 6d. reddish-purple,Perf.14,UM.,faintly toned gum,fine. 610 1934 1 1/2d.Photogravure booklet pane of four plus two labels,U. 627 1936 2s. blue,edn.359,Stamp Out Colds with Bovril,1d.pane inv. 630 Govt.Parcels:9d. dull purple & blue,U.,light centred violet circ. 654 1914-17 1/4d. Red Cross label in red,U.,Reg.`R’ & part cds.,fine. 664 1900-01 10c. ultra.,Wmk.Crown CA.,M.,heavier HR.,good appearance. 678 1955 5Fo. Centenary Of Printing Works,MS.,UM.,fine. (1MS) SG.MS. 679 1876-95 20c. pale lilac,Perf.14 x 13 1/2.Unused,good spacefiller. 681 1896-1900 16a. brown,Perf.12 1/2,M.,centred to bottom-left,good. 714 1935-6 2a. verm.,(small Die)Ovpt’d “CHAMBA SERVICE”,M.,HR.,fine. 723 1942-47 1a. pale yell.-green,Perf.8 1/2-9,M.,HR.,faint horiz. 744 1922 15Pi.on 1L.brown & green,UM.,tiny tone spot on one Perf. 750 1921 1c.,2c.,7 1/2c.,1L.No Wmk.,Perf.14,UM.blocks of four,fine. 761 P.Dues:1926 10L. black & blue,M.,faint hint of gum toning,fine. 838 1904-22 1c. grey-brown & green,M.,faint gum toning as usual,fine. 849 P.Dues:1c.,10c.,U.,cds.,toned with spotting on rev.,fair. 850 1951-55 Defin.to $5(ex.15c.& 30c.),M.,HR.,fine. (19) SG.61-81 (ex. 864 1938-41 40c. scarlet & dull purple,M.,heavy HR.,good appearance. 867 1895-99 50c. dull purple & greenish-black,M.,faintly toned,fine. 878 Conventionist issues:1914 2c. verm.,Ovpt’d type CVI,M.,HR.,fine. 903 1872-91 5c. ultra.,Perf.12 1/2 x 12 large holes,M.,good to fine. 906 1923 5c.& 10c. Imperf.horiz.pairs(printer’s strike issue),one 5c. very faint Perf.toning,quite a “wide” stamp for this issue,fine. 924 1864-71 1s. green,Wmk.Large Star,Perf.12 1/2,U.,part bars Pmk. 1013 1932 15k. grey-black,Perf.14,No Wmk.,U.,light Pmk.,good to fine. 1016 Officials:1922 3a. green,Ovpt’d,U.,corner cds,probably CTO.,fine. 1019 1921-29 5s. green & red on yell.,Wmk.script,M.,HR.,good to fine. 1045 1939-51 Defin.set to 10s. (ex.4 1/2d. )plus 3d.Perf.12,M.,(10s. 1054 1922-29 15c. deep greenish-slate,Die II,Perf.13 1/2 x 13,M.,good. 1058 1931 50c. greenish-slate,Air,Ovpt’d.Republica,M.,good to fine. nnant with two others(NORMAL)in left marg.bl.of four,UM.,fine. 1072 1978 25c.on 15c.var.Surch.inverted,UM.right marg.bl.of four,fine. 1076 1986 5r. WILD ELEPHANTS,horiz.Setennant strip of four,UM.,fine. 1082 1882-1903 40c. grey,Wmk.T.8a,Perf.11 1/1/ x 11,M.,good to fine. 1093 1940 20c.+ 5c. National Fete redrawn design,U.,machine Pmk.,good. gum,fine. This is probably the Official Reprint noted by SG. 1107 1923 2 1/2 / 10ths P.on 5m.,Surch.in blue/black,M.,good to fine. 1112 P.Dues:1923 1/2p.on 3p.,var.Ovpt. (due)double,M.,heavy horiz. 1122 1938-44 Defin.set to $4.80,plus 12c.black & slate-purple,M.,fine.